A standard day on a luxury cruiser like the Karnic 2965 in a normal person’s world would include something more along the lines of heading out with the family or friends to relax with a few boutique beverages and platters of assorted seafoods. If you take a glance at the boat, that’s most certainly the impression as it’s very stylish in all aspects, with classic modern lines and some really decent looking trimmings throughout. Aside from that it’s just on 30ft (9.14m) in length and far from overkill when it comes to size and general maintenance. As for that standard test on the Karnic 2965 ... rather than sipping cocktails and feasting on seafood while enjoying the marine scene, we opted for something a bit different – a test based on the lines of Tough Mudder, with Stefan Boating World’s sales executive Dave Robinson, his 11-year-old son Dan, my 10yo boy Reece and yours truly embarking on a full-on three-day adventure, fishing the 40th Little Ship Game Fish Tournament off North Stradbroke Island, QLD. Coincidently, Stefan Boating World is now the major sponsor of this event. So the plan was a full-on bay/offshore adventure fishing comp, staying three nights and three days aboard the Karnic 2965. 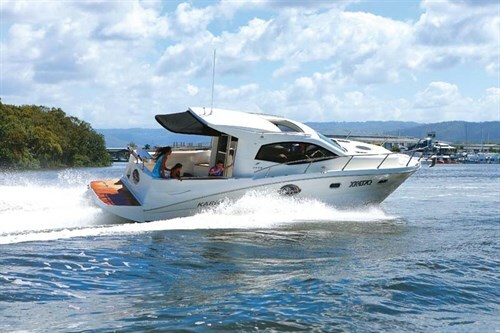 The plan was to launch from Coomera around lunchtime on the Thursday to give us a bit of time to see how the Karnic 2965 ran, as well as get our heads around the boat’s numerous operating procedures. Unfortunately, work constraints put me half a day behind. Five minutes into the trip I had literally turned this classic cruiser into a complete shambles. Ten rods, massive iceboxes loaded with ice and bait for all the fish we were going to haul in, food and drinks for the weekend... the list goes on. Standing on the teak boarding platform and rear deck of the Karnic 2965 – regardless of me making a mess of it – the size and space stood out immediately. 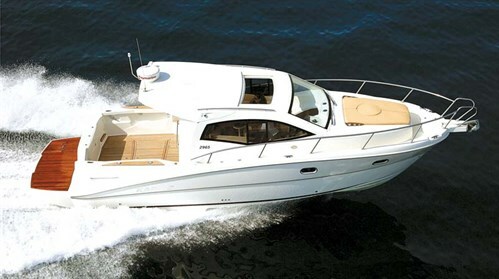 It’s a really generous size and totally usable, unlike other cruisers of similar size and style. The boarding platform is large enough to take a few beach chairs, while the rear deck has enough space for a full four-seater table and chairs. The Karnic has an extension bimini cover, sidepockets for a bit of gear, large flush-mount hatch and really good access to the twin-motor setup. 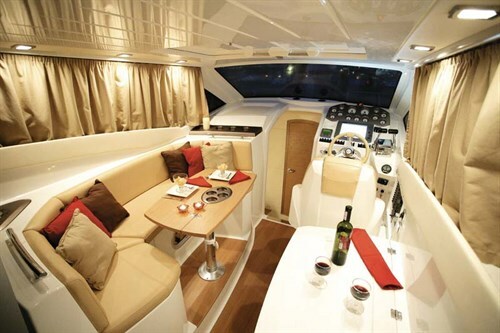 A fully enclosed and stylish wheelhouse awaits those chasing some indoor comfort or protection from the elements. Upon entry through the sliding door the natural light with side-window and sunroof ventilation eliminates the need for an air-conditioner, although it is an option and would be a good to have in the tropics. A portside lounger with a dinette insert table that drops down to create an extra bed, while a small fridge and mini-galley with sink and cooker on the starboard side take care of the indoor creature comforts. I like the way it’s set up, especially considering that it’s only a 30ft boat. Neat, stylish and with some decent trimmings, and its reasonably spacious considering the 3m beam. 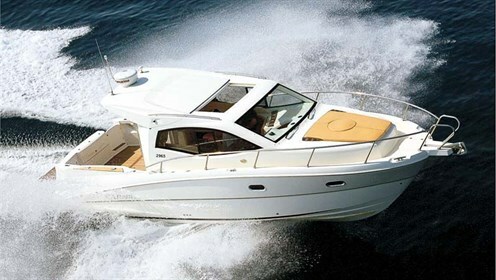 At the Karnic 2965 helm the captain has full windscreens and side windows for unobstructed views while driving. The dash is spacious and takes a decent-sized chartplotter-sounder (in this case top-of-the-range Garmin marine electronics), as well as all other operational electronics. The Fusion sound system which, even without amplifier, did a good job at keeping the crystal-clear sounds blaring. A few steps down into the bow bring you to another well-thought-out area of the Karnic 2965. Here the builder has managed to fit in a nifty small transverse bunk on the port side, ideally suited to the kids – although I did spend one night in it with my youngster and found I was a little too tall for it. If children are not welcome then I would probably use this area as extra storage for my valuable fishing tackle. To starboard is the head with shower and small vanity, and after long days on the water a nice hot shower was most welcoming. It’s not huge but definitely sufficient enough to scrub up and powder the puff. The main stateroom is located in the forepeak with a decent-sized double bed, clothing storage and a nice spacious feel to it. I like the added porthole for lighting as well as top-hatch for ventilation. Cruisers of this nature and style generally don’t come with a bucket-full of OMG performance, but I will say, man, the Karnic 2965 has got a set of legs that gives it quite the wow factor when it comes to performance. 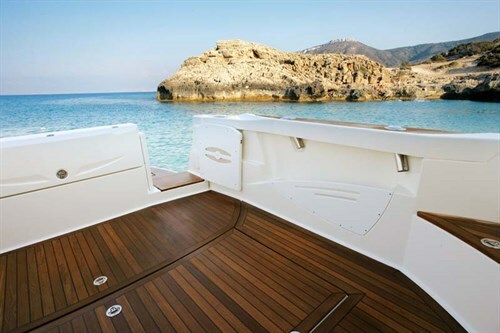 Fitted with twin turbocharged Volvo Penta D3-190 DPS marine engine, it has no issues on the power side at all. Going back to the first night of the adventure, the plan was to head over to the Little Ships Club as the competition started the following day – a good way to get sorted was socialise with mates and be bright and fresh for the following day’s early start. Leaving Redland Bay and not knowing the boat at all, I was advised that I would be at the helm as Dave’s knowledge of the banks and channels on the low tide were limited. As a local I had no issue with that, although not knowing the handling capabilities of the Karnic 2965 (and even worse a cracker rain squall) made it quite challenging. I was impressed at just how easy she was to manoeuvre off the pontoon, the Karnic 2965 being fitted with a bowthruster. Exiting into the main channel in the pitch black with pouring rain and a gusty southeast wind brought back fond memories of my warm, dry bed at home and a debate in my mind as to why the hell was I doing this, especially at this time of the night? I initially took it easy through the channels until I entered the main one out towards Peel Island and North Stradbroke, where I was confident enough to open her up a bit. With dimmed cockpit lights and a close eye on the Garmin chartplotter we eased our way over to the Little Ships Club at a mild cruise speed, which felt like around 15kts, until I peered down only to find we were doing 25kts – and the motors were acting like they were not even in gear yet. That was notably quite deceiving, due to the dark and most certainly the smooth comfort levels onboard. Finally, at around 10.30pm the Karnic 2965 was rafted up against a few of the other competitors’ boats – with a few laughs to be had and of course, a few light refreshments being consumed. Day one of the competition began at 5am. Our plan was to cross the South Passage bar between Moreton Island and North Stradbroke, so we headed out only to find the bar far from as inviting as the previous night. A gruesome trip through one of the centre channels had me pull the pin as it wasn’t suitable for the youngsters – a 2m swell combined with an outgoing tide and a decent 15kt wind didn’t appeal to me. Regardless I did a good job at putting the Karnic 2965 through its paces and it did a sterling job at handling it. To be honest it’s not really the kind of boat to go bar bashing with. Plan B was to stick to the confines of Moreton Bay where some serious mileage was done against, with, and quartering to the wind that by then was blowing closer to 20kts from the southeast. I might add that irrespective of direction to the foul bay chop, we still managed to comfortably cruise at 28 to 30kts, the twin Volvos just purring in the background. In a short chop, which is something we encounter on the bays regularly, the Karnic 2965 produced a very impressive ride. What’s more, when opened up to wide open throttle, this cruiser goes above and beyond standard cruise speeds and achieves a whopping 38kts top end which is flying on a boat of this size – and it handles it with ease. Opting for a night at the Tangalooma wrecks gave us a head start for the following competition day, with plans of heading out to Hutchies Reef and hopefully getting a few numbers on the board. A classic night of that cheerleader song again, gourmet ham and cheese sandwiches (that’s all we had left), some fun on big shovelnose sharks and a reasonable night’s sleep, had everyone amped and ready to slay some lunkers the following morning. A better forecast for the day had us expecting calmer seas and less wind, but that was short-lived as we edged our way out off Cape Moreton. The swell grew, the wind was angry once again and after taking on a few swells that I estimated at easily 4m, we again opted to pull the pin and head for the bay. In these kind of conditions I won’t deny that it wasn’t a rough ride but the Karnic 2965 could handle it, easily. I was a bit concerned about the following sea as the swell was large, choppy and quartering the stern. A bit of extra throttle kept the hull pulling out of the troughs and the ride nice and comfortable. It was a wild weekend and a wild boat review to say the least. Wild winds and wild swell — but it was great. The Karnic 2965 most certainly gained respect from me over the weekend with its impressive performance, handling and superb economy. 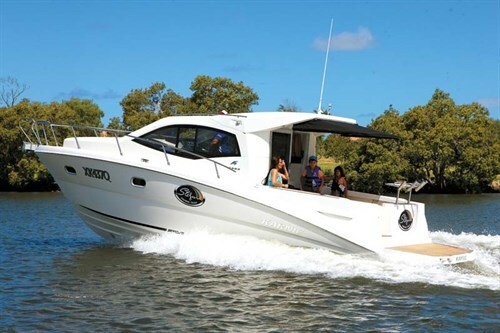 The Karnic 2965 is most certainly a 30-foot cruiser loaded with comfort and style, as well as plenty of creature comforts suited to overnighting or even extended stays on the water. Priced at $279,000 as tested, I think it’s also a lot of boat with a lot of features for a pretty reasonable price.